In less than five minutes you can create your own hoodie with your photos printed on it. Never worry about that awkward experience of someone wearing the same outfit as you, your custom hoodies will be truly unique. Your new favorite hoodie, designed by you and printed by us, almost too good to be true, almost. 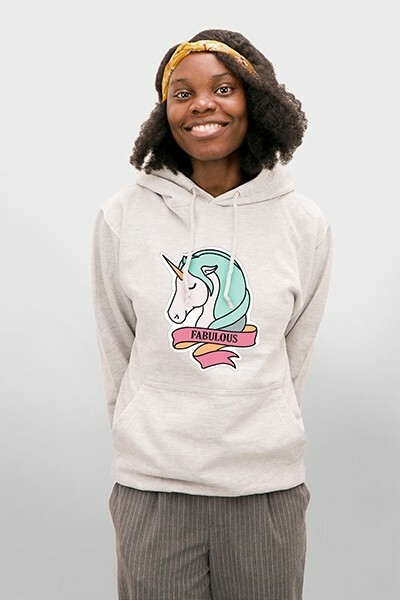 Our years of experience with printing personalized items and creating an easy to use Customizer mean that when you design your own custom hoodies with us, you can do so with minimal fuss and with a great end result. We’ve done our best to make the process of creating custom hoodies as quick and easy as possible while still ensuring that you get that the best quality hoodies. We print in high-resolution on high-quality hoodies so that you will be proud to wear your hoodies. Finally, you can create that funny hoodie as a Christmas gift or create the perfect hoodie to match your style that you were never able to find in stores. Start creating your designs today. You don’t need to be a graphic design expert to create incredible custom hoodies. We’ve made it so easy that anyone can create a custom hoodie if they know how to use Instagram. In a few simple steps using our specially made customizer, you can upload your photo, make small adjustments, add text or emojis, and submit your design. Just be sure to only use PNG or JPEG image formats and to double check your designs and order details are perfect before submitting your order. We’ll then print it and ship it to you. It’s so easy, you’ll be struggling to choose from your favorite designs. Give designing your own personalized hoodie a try today! Done creating the design for your personalized hoodie and checking whether the size, color, and shipping info are correct? Great, this is where we take over. Once your order has been submitted, we’ll start working on your order very soon. Once the hoodies are printed and checked for imperfections or mistakes, we’ll package it up and ship it off to you using trusted shipping carriers. Now comes the hard part, waiting patiently for your new favorite hoodie to arrive. Start designing your custom own custom hoodies today!